Kevin Murray helped to lead a major charrette-type collaborative training exercise at Isra University in Amman, Jordan, working alongside Husam Al Waer (Dundee University) and Samer Bagaeen (Brighton University). 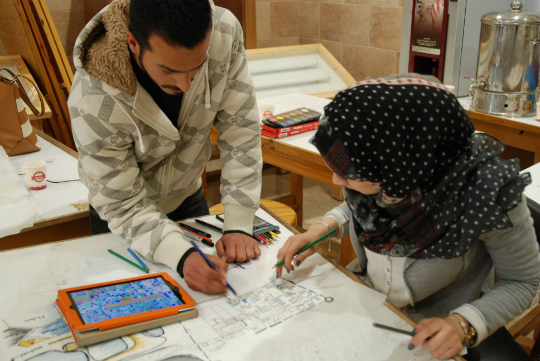 Led by Dr Nawar Alatassi, the exercise sought to simulate actual charrette process evolution over several days, with students working collaboratively in groups to address two different types of urbanism challenge within Amman’s rapidly changing city. The students investigated the areas from the perspective of different owners, users and policymakers, developing design proposals for improvement, integration and healthier, more convivial environments. The exercise proved a great success, with the participants developing their analytical, design and integration skills, with the quality of their team-working particularly notable within very tight timeframes. The culmination was a final presentation and certification event. It is intended that this intensive ‘learning by doing’ model can be used as a basis for further collaborative placemaking training in the future.